This is one of the most preferred food in the state of Karnataka. It is the food which is preferred instead of Rice. Its known for its Strength Properties & highly recommended diet by doctors to maintain the sugar levels (diabetic patients). Recommended to toddlers in the form of soup to increase the Immunity. The method of eating is to wet your palm or the fingers (with Sambar or Curry) cut a piece of it dip it inside the Sambar or Curry and swallow (no chewing). It tastes very good with Little Ghee in Sambar or Curry. First time you might feel weird but with a constant use you will gradually feel its properties and love to have. Switch on the stove, keep it in high flame. When it starts to boil (turn to low flame) slowly add ragi flour with constant stirring. Close the lid, cook for 5min in low flame. Switch off the flame, mix well. Wet your hand & a plate with little water. With the wet hand press the dough against the plate and keep rolling to make it round balls. Note: Balls should be done when it is hot. 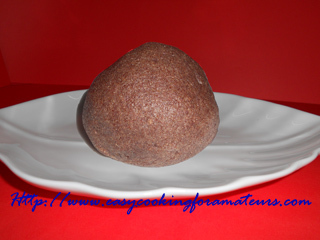 Ragi balls are ready to serve with any curry. Dip it in curry & swallow it. Delicious healthy food. Love it. i have never heard anything about this.looks interesting... love to try it.. will it be sticky??? if you don't wet the fingers (with Sambar or Curry) or if you chew it will stick. this is new to me... looks healthy and filling.. am first time here.. following u..
Ragi is the synonym for healthy, rt? this is new for me..
Am your new follower now..
hey u have a pretty space here.Thx for visitg my blog...gd collecion and some which is unheard....will c u again. It's new to me but very healthy and delicious..
Yummy we call it sangiti. Healthy dish..new to me,must try this..thanks for sharing dear.